There’s something about the cups. 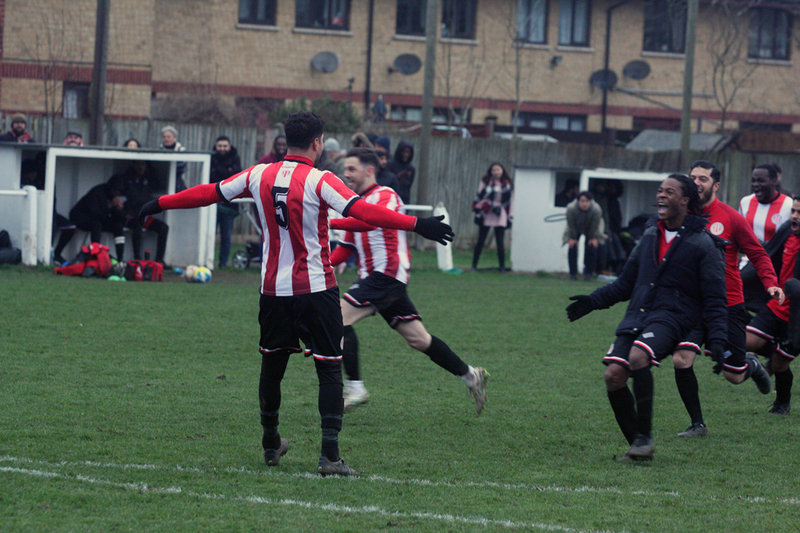 On Saturday, Clapton Community knocked London Samurai Rovers out of the Jim Rogers to progress to the last four. 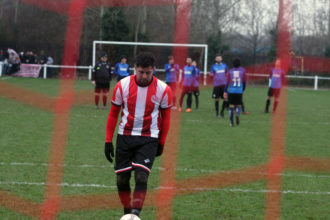 They held their nerve in a tense penalty shootout – after a tense game. 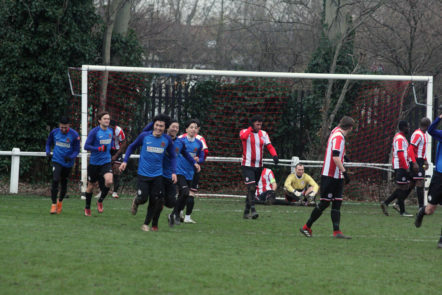 The heroes were keeper Dan Anfossy, who stopped Samurai’s fourth and scorer of Clapton’s decisive fifth Yacine Rabia. 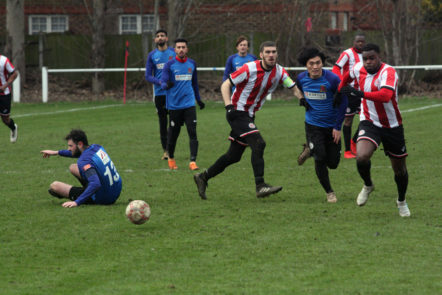 Desperate to arrest a run of three consecutive defeats, player-manager Geoff Ocran was able to bring Paul Oshin back to add midfield steel. From the off, Samurai knew they were in a more competitive contest than the one-sided league clash in November. The first half was mostly offside decisions, with occasional outbreaks of football. Samurai repeatedly tried to spring past the Tons backline, but struggled to get their timing right. Clapton too fell afoul of the flag. On 10 minutes Jake Stevens stroked home from close range, only for it to be chalked off. At the start of the second half, our top scorer Stanley was played through on goal, but could only shoot straight at the keeper. Anfossy made a fine low stop and up at the other end Adejokun had his dangerous shot saved. Just after the half hour mark, Ocran threaded through and Stanley was through on goal again. This time, he finished with aplomb. The offside trap and the Samurai goalie were finally beaten. 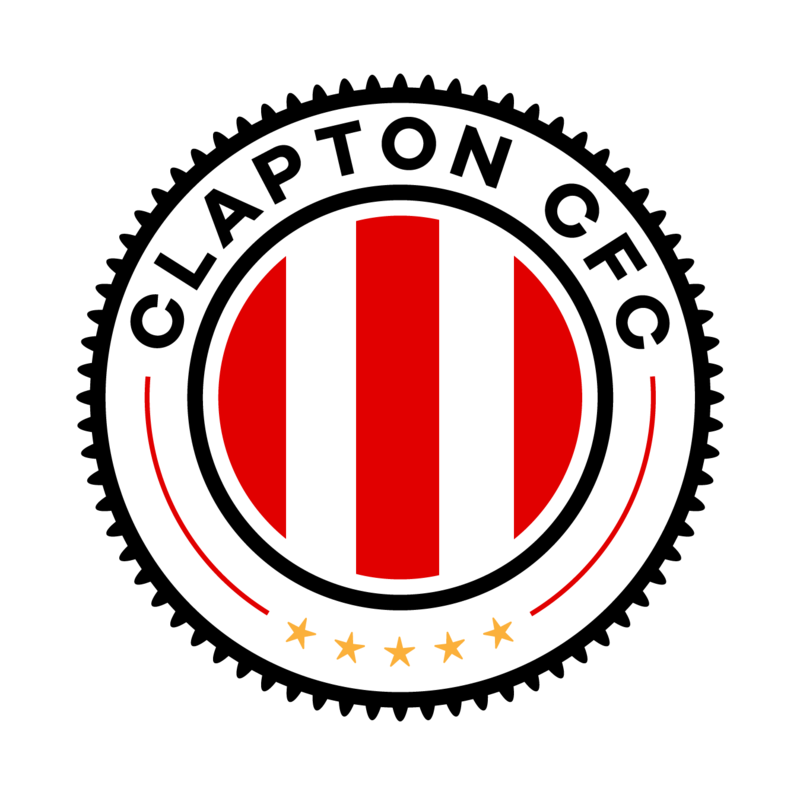 1-0 Clapton. Stefan Nielsen came on as a sub, straight off a flight from Houston, and immediately started causing Samurai more problems. On Samurai’s pristine 3G home ground, they play like Barcelona. On the Stray Dog pitch in winter, things just got messy. 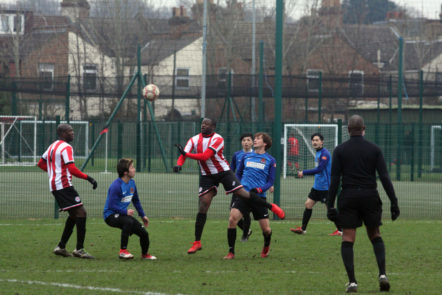 The Samurai players were trying to take too many touches in the Clapton box. The bobbles were putting them off their shooting game. Their manager bemoaned the surface after the match. But this factor obviously hasn’t hindered them in their other away games this season, some of which would have been played on more cabbage patch-like pitches than the Dog. Into the last ten minutes, Samurai managed to force an equaliser through a close-range shot by Wataru Tobe. After that, the away side were applying all the pressure. 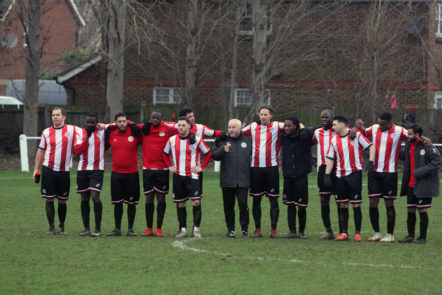 With no extra time, Clapton were happy to see it go straight to penalties. The Tons fans piled into the thin strip of ground behind the goal to form a distracting backdrop for the Samurai penalty takers. And an encouraging backdrop for the Clapton ones. And a distracting presence for the Samurai keeper. But the quality of the penalties was excellent. 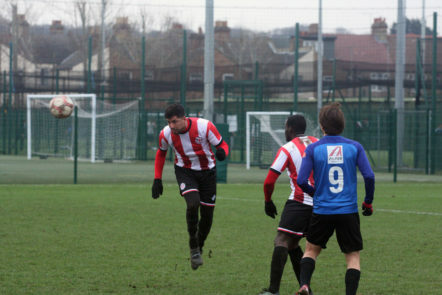 The first four were confidently dispatched by Stanley, Nielsen, Stevens and sub Bogdan Panescu. Samurai were similarly clinical from 12 yards, until their fourth taker sheepishly stepped up. His unconfident effort was easily stopped by Clapton’s sticksman. It was left to player-coach Rabia to fire in to make it 5-3 and book the Tons a semi final spot. That tie is scheduled to be played on the 3rd of March. 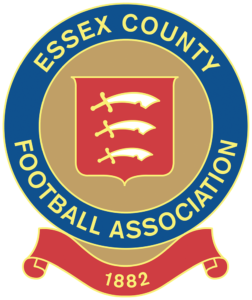 But Yeading Town, FC Roast and Wilberforce Wanderers need to fight it out among themselves to sort out who the opponents will be. This victory meant a long-awaited chance for the players to sing with the fans. Even if Ocran joked that they couldn’t remember how it went. 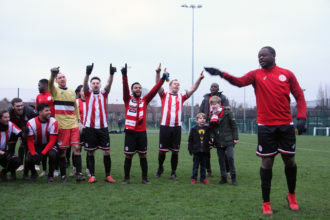 We talked to the jubilant Clapton management team (plus match captain Eliot Crosbie) about what had gone so right on the day. When one of the players is being carried aloft after the final whistle, there can be little argument. New goalkeeping coach Tolga Ulasan, was understandably impressed with Anfossy’s performance. Great performance from Dan today some vital saves at 0-0. Then there was That penalty save to top off a great week. Brilliant from the whole squad too. My first taste of our fans as well… INCREDIBLE they were.